In university, I took a grad course in vulcanology. By the end of the semester, I didn't learn a damn thing about Spock, but I did learn an awful lot about volcanoes. Combined with the knowledge imparted by the various other courses suffixed by -logy or prefixed by geo- that rounded out my degree in Earth & Planetary Science, I came away with a much greater understanding of our planet and the universe it resides in - as well as a bounty of ammunition to pedantically level at Hollywood and its laughable attempts at "science." While it often requires no special education to point out absurdity or plot holes in disaster movies, here are five mistakes and oversights I've seen in volcano movies that may not be obvious to everyone. The usual disclaimer: We are analyzing the science in fiction not to take away from the work as a piece of fiction, but simply For Science! Regardless, "because STORY" isn't an excuse for bad science; that's a cop-out to avoid having to rework a plot element. 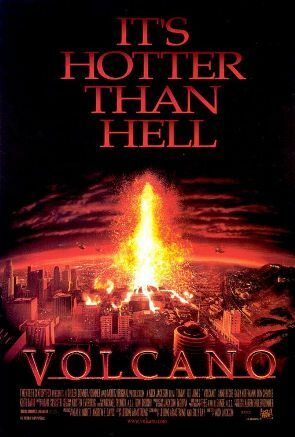 In the 1997 movie Volcano, Los Angeles is suddenly attacked by a killer volcano! Fortunately for you Los Angelites, that plot is about as realistic as the alien-invasion Battle for Los Angeles flick. Possibly even less realistic. Volcanoes form in very predictable places: over so-called "hot spots" like Hawaii and Iceland, and in "volcanic arcs" like Japan or the Cascade Range (which includes Mount St. Helen). Hot spots are fixed regions far below the Earth's crust that give rise to volcanoes on the surface. 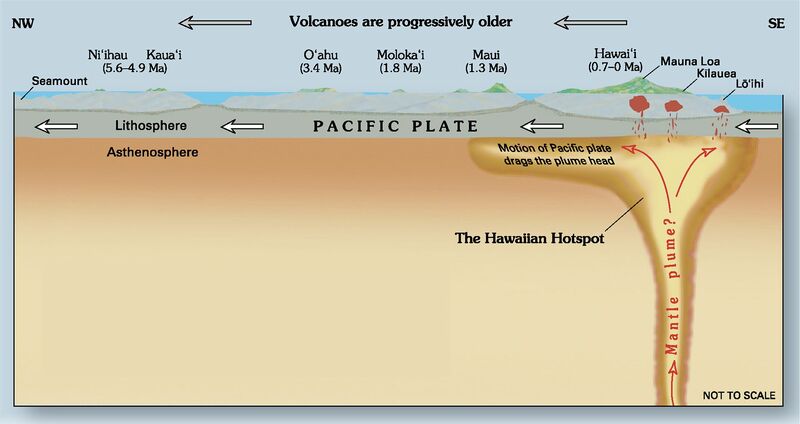 While the hot spot remains in a fixed position, the drifting of tectonic plates above a hot spot over time results in one active volcano followed by a chain of extinct volcanoes, like the Hawaiian islands. Volcanic arcs form near "subduction zones." 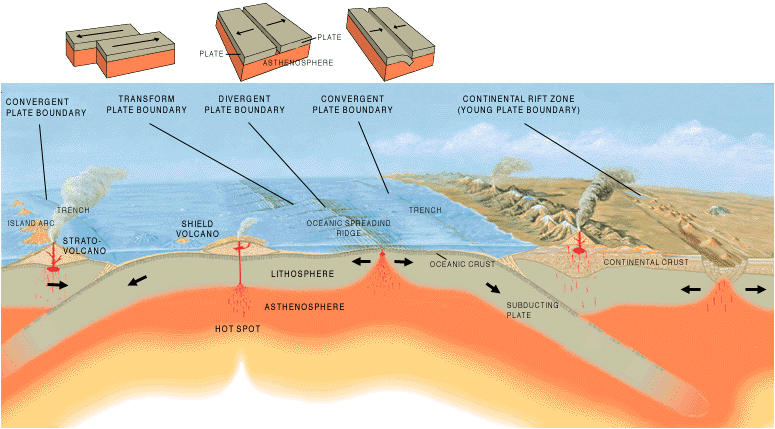 The Earth's crust is divided into a number of tectonic plates that are constantly forming, melting, and interacting. Plates can interact in three ways. The Mid-Atlantic Ridge, for instance, is an area where two plates are spreading apart, allowing magma to flow up from the mantle and form new crust (new plate material). The San Andreas fault is a region where two plates are sliding by each other, causing earthquakes due to the friction of the plates rubbing against each other. 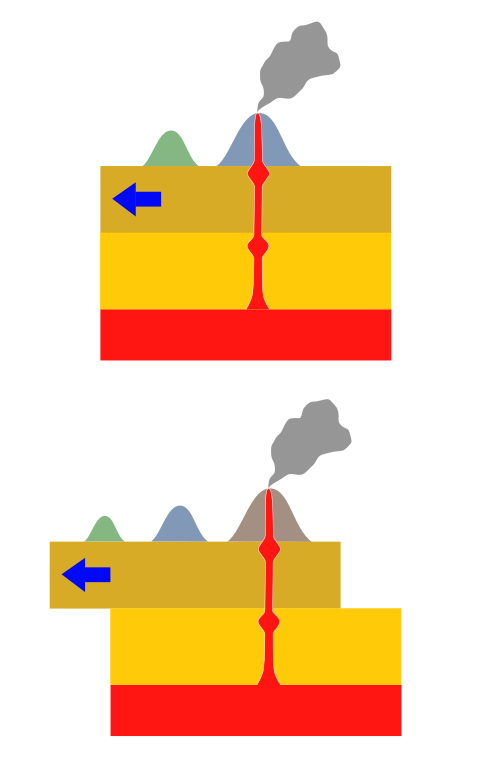 The third form of interaction is collision between two plates, which results in one plate being "subducted" under the other and back into the mantle. When the plate is subducted back down into the mantle, the heat and pressures it experiences squeezes water out of it (yes, rocks contain water! ), and that water causes melting in the mantle which gives rise to volcanic activity on the surface in an arc-like pattern, when viewed from above. The arc of the islands of Japan are a terrific visualization of this phenomenon. 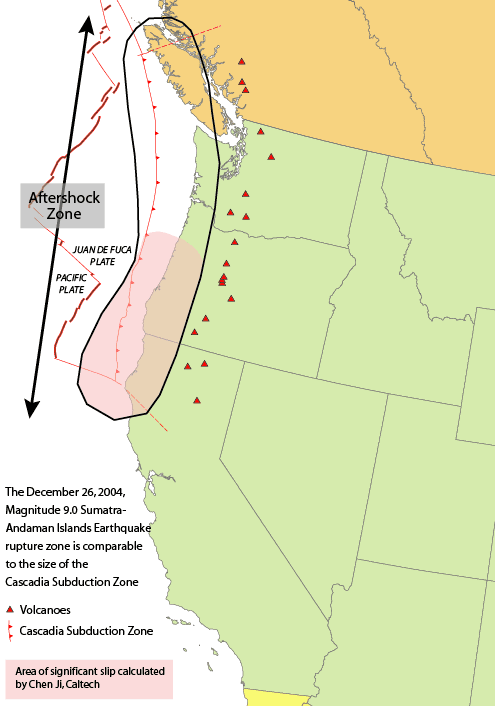 Los Angeles is located neither near a hot spot nor a subduction zone. It is near the previously-mentioned San Andreas Fault - earthquakes yes, volcanoes no. Mexico's Paricutin volcano is an example of a volcano that formed very suddenly (by geologic standards), but that region is a subduction zone. All the script writers had to do was place their fictional volcano in any of the world's many volcano-forming regions for the concept to be plausible. I live in the Canadian city of Montreal, named after the hill in its center known as Mount Royal (Mont Real). A popular misconception around here is that Mount Royal is either a dormant or extinct volcano. No, it is not. Mount Royal isn't a volcano, it wasn't a volcano in the past, and it never will be a volcano. The type of rock is inconsistent with it ever having been a volcano. My dear grandmother, who immigrated here from Italy decades ago, lives in fear of it one day erupting. And I don't know how to say, "it is simply a plutonic intrusion of igneous rock" in Italian.